The recent suppression of scoring throughout the league along with shorter outings from starting pitchers means that more games are being won and lost between innings 6 and 9. The 7th and 8th inning guys never got much respect in baseball but with the increase in high leverage, late inning moments, a reliable setup man or two are now essential. Closers were always thought to be the most dominant pitching option in the bullpen but lately we've seen that having a guy that can breeze through the opponent's lineup 1-2-3 in the 7th and 8th innings is almost as valuable. Our fantasy league has also recognized this as the owners passed a rule change proposition to change the Save stat to Saves + Holds and the owners passed this with minimal resistance. This rule change will also increase the importance of a dominant setup man in our league as holds are now worth the same exact value as saves. How much will this shift our thinking in the Shocker Fantasy Baseball League, well, let's try to figure that out. In most fantasy leagues, a setup man is used to slowly shrink a team's ERA and WHIP while we the owner hopes that the closer ahead of him gets injured. Now, we can throw away the closer voodoo dolls and simply enjoy watching our setup man rack up the holds in addition to lowering our rate numbers. It might be hard to know exactly which setup men will be worth a roster spot and how much these guys will be worth compared to the certified closers and we'll use our familiar friends of Microsoft Excel and simple math to try to find an answer. Below are the save leaders for 2014 along with the amount of holds they accumulated. For most of these tables below, I decided to grab the top 36 RP's because I figured that that's about the amount of RP's we as a league have on our rosters as a whole. You will see the player's Saves to the left, their Holds in the middle, and their overall Player Rank on the right when accounting for only Saves, not holds. The top save leader was Rodney with 48 and the save totals decrease pretty steadily all the way down the list. Saves are a big component to the value of a RP in our league but there are K's, Losses, ERA, and WHIP that also play a factor. Rodney earned the most saves but due to a handful of blown saves and meltdowns, he was only the 7th most valuable RP in our league. This list isn't too eye opening except for it does give you a decent idea of how many closers start with and maintain the closer role throughout the season. As a fantasy owner, it was generally wise to seek out a pitcher that had save opportunities under most circumstances because saves were a commodity and getting them whenever you could was a smart strategy unless you just wanted to punt the save category, which some owners did. 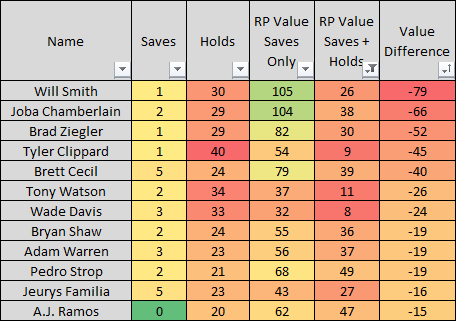 There are about 20 reliable closers that didn't fall victim to injuries and/or demotion, which means there are about 16 other RP spots that we as a league need to fill with the remaining RP options. As you can see, the rank of save leaders is pretty similar to the overall RP ranks except for those pitchers that experience meltdowns more often than others, like Rodney, Rosenthal, Cishek, and Reed did in 2014. So now that RP's can earn holds and saves for equal value, let's take a look at the holds leaders in 2014. Tyler Clippard was Hold Gold in 2014 but after him, the amount of holds per pitcher starts at 33 and moves pretty steadily downward. The hold leaders generally maintain their setup role on the team except for guys that lost their closer job early (Storen) or gained it late in the year (Joe Smith). Otherwise, setup guys will earn a save or two throughout the year only when the closer needs a rest for a night. You can see that our top RP's will still rack up more saves than holds but the setup guys are a viable option when it comes to filling out a bullpen. This list below shows the top Saves + Holds pitchers in 2014 to get a better idea of where closers and setup men will land once the season ends. We're starting to see the setup studs plant their flags amongst with the top closers but we don't have to worry about setup men earning more Saves + Holds than the top 12 closers, in most cases. 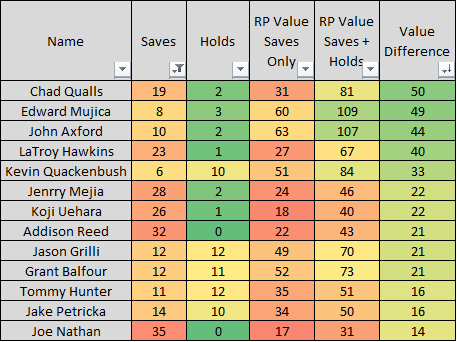 In order to know exactly how much value will be added by the players that accumulate holds, lets stack up our top RP options in 2014 to see where they ranked when we used only saves and where they would've ranked if we used Saves + Holds. Below is a table that shows the 2014 RP rankings in order if we used Saves only and to the right, their rank if we used Saves + Holds. You can see that our rankings would've shifted around a fair amount if we incorporated holds last year. Guys like Britton and Melancon would've seen their value rise due to their hold totals while closers that kept their 9th inning job but also caused a lot of agita, like K-Rod, Street, Rondon, and Joe Nathan, tumble down the ranks a bit. We still aren't learning all we need to when it comes to making a decision on whether to pick a somewhat shaky closer or a rock solid setup man but I think we'll start getting some answers below. Now let's look at what our RP rankings would've looked like if we used Saves + Holds last season. I've sorted the SVHD leaders with their ranks on the far right to see where they match up to the Saves only rankings in the third column. We can now see the tipping point and it comes around the 7-10 range in our RP rankings. Wade Davis, Clippard, and Tony Watson move from borderline bullpen options in a saves only league to top 12 guys in a Saves + Holds league. Suddenly guys like Rondon and Nathan go from RP's that you can deal with to guys that you can probably drop if there are better setup options on the waiver wire. The best closers will probably make up the first 10-12 picks in our draft, which they should but the lines become blurry after than when it comes to picking up a top setup man or a inconsistent closer. Let's see who would've lost the most value if we went to a Saves + Holds league last year. This list is loaded with guys you just hate to own but almost have to. You just pray to god these guys came in with a three run cushion in the 9th because if it was tighter, it seemed like a 50/50 chance they would blow it. These are all pitchers who were probably the third or fourth best option out of the pen for MLB mangers but were given the rock in the 9th for too long. Most of these guys eventually lost their jobs but not after ruining your ERA and WHIP in the process while also adding a couple of Losses to the list. Now, their leash will be much shorter as there won't be as much need to hold onto these unreliable closers when there are better options on the waiver wire. Who would've benefited the most last year if we used Saves + Holds? I'm glad you asked. I have to admit I was surprised to see Joba Chamberlain on this list because he wasn't good at pitching last year but he did get 29 Holds, which helped move him from 104th to 38th ranked. He probably wouldn't have been in a starting lineup in our league even with the rankings bump. In fact most of these guys besides Will "Fresh Prince" Smith, Clippard, Watson, and Davis would be a viable option when we look at the guys that will gain the most value in our SVHD world. Instead most of these setup guys will go from being absolutely out of the picture to maybe creeping on your radar if you're in need of some RP help. So what did we learn here? Overall, the top closers will remain the top RP's to stick on your roster but once the best 10-15 closers are no longer available, it's just as smart to pickup a stud setup man as it is another closer. I think our rule change is another smart reflection on how value is determined in the major leagues, too, as you could argue guys like Wade Davis, Clippard, or Betances are just as valuable as almost any other closer today. If a setup man comes in the 8th with a lead and takes down the middle of the order, isn't that even more valuable to a team than the closer who comes in the next inning and closes the game by getting outs on the 7th, 8th, and 9th batters in the order? On top of that, setup men can sometimes come in with men on base in a very tight ballgame where the closer generally starts an inning off fresh with no runners to worry about. I'm not saying that closers are worth less than the other guys in the bullpen, because they are not most of the time but I am saying that sometimes the lights out setup men can bring the same, if not more value to a fantasy and real baseball team. There's too many outside variables that determine whether a setup man or the closer is more valuable on any given night, which is why we're starting to see top setup men get paid in the big leagues and setup men will start getting drafted much earlier in the Shocker League, too. I also think this rule will make it easier on the fantasy owners that aren't by a phone or computer all day long and cannot fill gaps in their bullpen as easily as others. Before, it was really smart to pounce on a pitcher that was just named a closer during the season because saves from an RP2 or RP3 spot are pretty hard to come by. Now, owners can ignore these newly crowned closers if they already have stability within their bullpen with reliable setup men. We were smart to recognize the dominant setup men and now we will be able to enjoy watching a better collection of relief pitchers play in our fantasy league in 2015 thanks to this new rule.